We help protect you when you buy and sell online but there are some things you should know and do to help keep you, your information and your money safer. 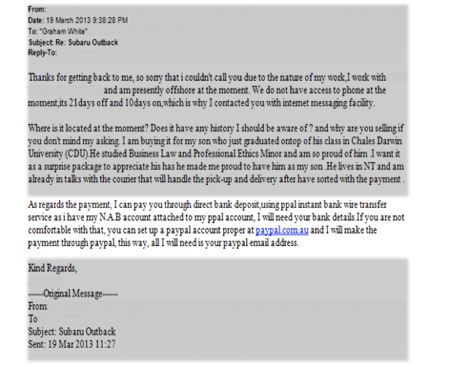 Watch out for hoaxes, phishing and scams. Online hoaxes are getting more sophisticated, making it tough to know whether an email, SMS or website is real. It’s important you learn how to spot the fakes so you stay safer online. Hoax websites often look like the real thing. Also beware of unexpected emails, Facebook or other online messages from a friend asking for money. Their account may have been hacked. In this example, you’re told your account has been limited and you must click a link to log in and unlock your account. The site you visit may store your login credentials – your email and password – so that they can log in to your real PayPal account later. It’s common practice for emails to include links to further information. However, before clicking on a link to log in or provide personal or financial information you should hover your cursor over the link, or tap and hold it on your mobile, to confirm the URL is a paypal.com.au or paypal.com address. 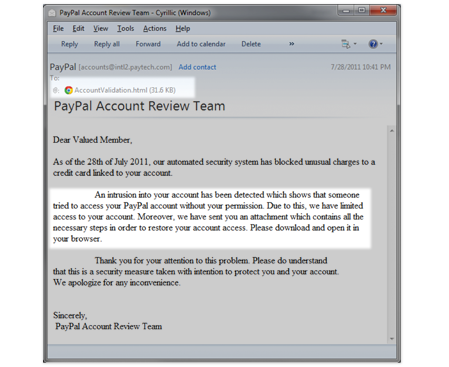 If you’re unsure if an email you’ve received is really from us, forward it to phishing@paypal.com.au then delete it. We’ll let you know if it’s real or not. In this example, you’re told there has been an unauthorised attempt to access your account. The sender asks you to open or download an attachment which provides details of what you should do next. You should never open email attachments unless you’re certain they’re from a trustworthy source. Attachments may contain malicious code which can infect your computer with a virus or give the sender access to or control of your computer. We’ll never send you an email with an attachment. In this example, you’re told of a suspected unauthorised transaction and asked to click a link to confirm your identity. Check whether the email includes your first and last name – we’ll never use generic greetings like “Dear PayPal customer”. Also watch out for bad grammar, typos and old logos. 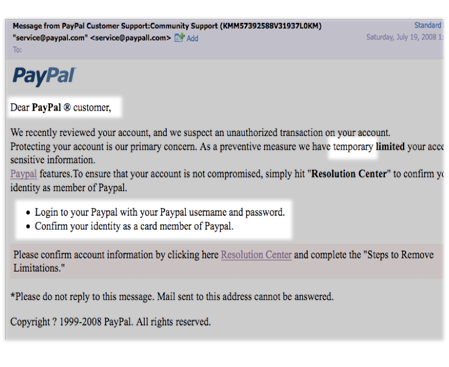 In this example, the sender states they’re contacting you on behalf of PayPal. You’re told the buyer has paid but the money won’t be credited to your account until you’ve shipped the item. In some cases, the sender may demand you use a specific shipping service or wire money to them in order to have your funds released. Sometimes payments you receive won’t be available to you immediately but they will always appear on your PayPal account. If you’re unsure, visit www.paypal.com.au and log in to your account and check your transaction history. If we’re holding a payment, we’ll let you know on the transaction details page if it’s safe to ship the item or not. If you receive an email like this, forward it to phishing@paypal.com.au then delete it and discontinue further communications with the buyer. In this example, the recipient has listed their car for sale online and the buyer is offering to pay by PayPal. They state they’re unable to see the car or be contacted by phone as they’re offshore for work. In this common scam, you’re asked to pay administrative costs or ship an item, usually through the buyer’s specified shipping agent at your cost, with promises of the funds being added to the total sale price. Once the sale is agreed upon, you’ll receive an email, claiming to be from PayPal, saying you’ve been paid. Always log in to your PayPal account to ensure you’ve received payment before shipping any item and only ship through your chosen shipping provider – don’t use a buyer’s agent. If you receive an email like this, report it to the site you’re selling your item on and cease communication with the buyer. Before shipping any item, always check the payment is available in your PayPal account. In this example, you’re advised that you were sent too much money for a sale. 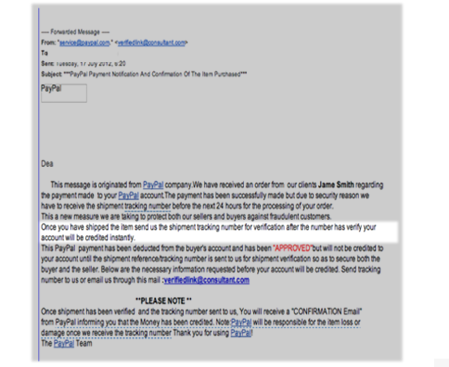 The email, claiming to be from PayPal, asks you use an alternate payment service, in this case Western Union, to refund the excess payment to the buyer before funds will be released into your PayPal account. The email warns you should not contact PayPal. We’ll never ask you to wire money through an alternate payment provider, no matter the reason. We will also never tell you not to contact us or that we’re unavailable to speak to you about a transaction. When receiving notifications of payment, always visit www.paypal.com.au and log in to your PayPal account to confirm the payment appears in your transaction history. 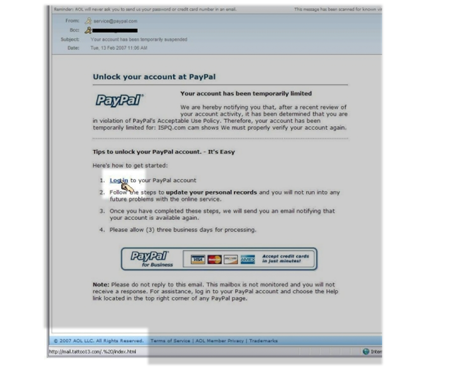 If you receive an email like this, forward it to phishing@paypal.com.au then delete it. Do not communicate further with the buyer or their agents. On many internet browsers, suspicious URLs turn red to warn you the website could be fake. Regularly update your browser to ensure you’re using the most recent and secure version. Check your browser’s guidelines around how to more effectively identify phishing or fraudulent sites. Create safer passwords and PINs. It’s important you protect your password and PIN details as you could be liable for an unauthorised transaction if you voluntarily reveal your password or PIN to anyone else or fail to protect it. Your liability for losses from an unauthorised transaction is limited by the ePayments Code. Smartphones and tablets need to be protected, just like your computer. We use the latest security technology to help protect you from online fraud. We authenticate outgoing emails with DMARC technology. Participating email providers mark unauthenticated emails as hoaxes and send them to your spam folder or restrict their delivery to you. We have staff dedicated to answering your phishing email queries, identifying unauthorised transactions and working with local authorities to help stop scammers. When you communicate with us online, your data is encrypted. I’ve received a request for information. How do I know it’s really from PayPal? An email I received looks genuine but I still feel unsure. How do I know it’s from PayPal? If you receive an email claiming to be from PayPal and you’re not sure, consider our checklist above. 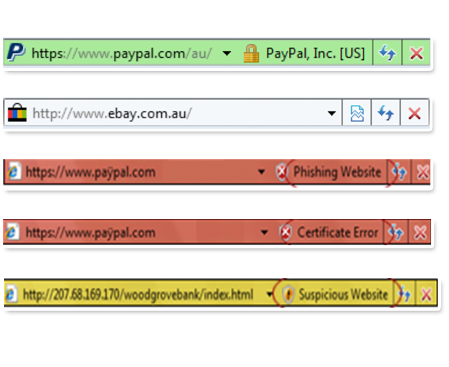 If you’re still unsure, trust your gut and forward it to phishing@paypal.com.au. What are some examples of common scams?